On the 20th anniversary of its democratic experiment, Indonesia can cite significant gains. Growing challenges may threaten that progress. 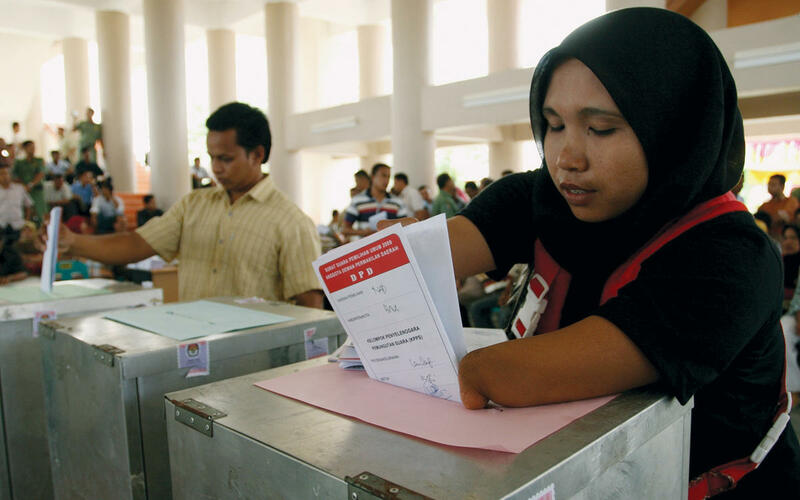 A woman votes in the 2014 parliamentary election in Aceh. With a population of more than 260 million and an economy that ranks tenth in the world, Indonesia appears destined to be one of the major international players of the 21st century. Since the 1998 overthrow of H. Muhammad Suharto’s dictatorship, the country has cut its poverty rate in half, and its per capita gross domestic product now exceeds $3,500. And despite the weight of decades of dictatorial rule, post-Suharto Indonesia has made steady progress toward becoming a full and functioning democracy. Those who had faith in the promise of Indonesia’s democratic experiment have largely been vindicated. In addition to Parliament and other political institutions, an array of nongovernmental organizations focused on the defense of democracy, human rights and the environment have emerged. It is also noteworthy that just one of Indonesia’s presidents in the post-Suharto era has been a military figure. Still, the country faces many of the same challenges today that it faced 20 years ago. An entrenched elite who benefited from years of association with the Suharto regime, including those with ties to the powerful Indonesian military, remains in place. Despite the sharp reduction in poverty, half the population is economically vulnerable and, according to the World Bank, the wealth gap is growing. Uneven health and educational services, and the activity of radical sectarian elements create additional social pressures. During the past 20 years Indonesians have chosen national leaders four times, first through parliamentary elections and then direct popular elections. Those elections have proceeded without significant violence or irregularities and, with one exception, the subsequent transitions have complied with the Indonesian Constitution. Yet even that case suggests strong support for civilian rule. In 2001 the country’s armed forces refused to obey the orders of Abdurrahman Wahid, the nation’s first democratically elected president, when he sought to declare a state of emergency to head off his removal. Instead, 40,000 troops marched into the capital with guns pointed at the presidential palace. Parliament then voted to remove Wahid from office, replacing him with Vice President Megawati Sukarnoputri. Megawati lost her 2004 election bid to Susilo Bambang Yudhoyono, a retired general who, as a minister in Wahid’s government, had refused to support his call to declare a state of emergency. And in 2014 President Joko Widodo (popularly known as Jowodi) defeated a field of candidates that included major military figures. Political transitions and governance at the provincial and local level have not always been as democratic as those at the national level, to be sure. Significant economic and judicial corruption, as well as the extensive role and power of the Indonesian military, continue to influence political campaigns, party candidate selections and elections. At the same time, respect for personal freedoms in Indonesia is constrained by what Amnesty International describes as “broad and vaguely worded laws” that are used to “restrict personal rights, notably the right to free expression and of peaceful assembly and association.” Many of these statutes date to the Suharto era, and some back to the period of Dutch colonial rule. Political transitions and governance at the provincial and local level have not always been as democratic as those at the national level, to be sure. The criminal code includes articles criminalizing “rebellion,” “incitement,” “defamation” and “blasphemy.” These crimes, which are not well-defined, have served as the basis for charges against all manner of dissent, and even peaceful protest. The U.S. State Department’s annual 2016 human rights report for Indonesia notes that “elements within the government applied treason, blasphemy, defamation and decency laws to limit freedom of expression and assembly.” For its part, Amnesty International counts at least 38 prisoners of conscience in Indonesian prisons. Religious and other minorities, including LGBT organizations and citizens, face harassment, intimidation and violence, especially from militant Islamists. The government does not effectively protect minorities from such violence, and sometimes actually stokes it with inflammatory rhetoric. The National Human Rights Commission is not an effective body in addressing systematic or specific abuses. The body has no formal powers of investigation, such as subpoena power, and the government is not obliged to act on its recommendations. Its reports have not led to effective prosecutions, even in notorious cases like the 2005 murder of a prominent human rights advocate, Munir Said Thalib. The Indonesian media scene in 2018 is vastly different from that of the Suharto era, when government censorship and self-censorship characterized print and broadcast media. Indonesian media today are robust and largely free of government control and sanction. Nevertheless, journalists, and sometimes publishers, face extra-judicial threats and sometimes violence by entrenched economic elites and religious organizations. Security forces, either acting in league with these interests or on their own behalf, are often the agents of intimidation and violence. The corrupt Indonesian justice system gives those who are targets of critical media treatment over corruption and other abuses avenues to challenge journalists, publishers and NGOs in the courts. The U.S. State Department’s annual human rights reports for Indonesia have consistently noted that “elements within the government, judiciary and security forces obstruct corruption investigations and harass their accusers.” The same can be said of efforts by security forces and other government elements to block investigation of abuses of human rights, including crimes against humanity dating back to the birth of the Suharto dictatorship in 1967. The armed forces’ political and economic clout remains essentially unchallenged. Ever since its founding, the Indonesian military has derived funds from legitimate and illegitimate businesses, as well as rent-seeking relationships with national and international enterprises operating in Indonesia. Because its responsibility is based on a concept of “dwi fungsi,” or two functions, the military is empowered to play both a defense role and a sociopolitical role. The latter, its “territorial” role, involves maintaining a security, political and economic presence down to the village level. This “territorial” role is supported by intelligence operations that include both monitoring of and sometimes involvement in local political activity, especially dissent and media activity. Through this involvement of active military forces, and in collaboration with retired military officers, the military retains significant influence over political party activity at the local, provincial and even national level. Command responsibility is not acknowledged in these abuses, and when officers are charged the investigation is internal. In the rare event of a conviction, perpetrators receive administrative actions and sentences that are not “commensurate with the severity of [the] offenses,” as the State Department’s human rights report puts it. This absence of appropriate justice encourages security force personnel in such conduct and intimidates the general population. Corrupt and impervious to calls for its accountability before the Indonesian judiciary, the Indonesian military conducts itself very much as a Suharto-era institution. In 1999 the people of East Timor voted in a United Nations–supervised referendum for independence from Jakarta. The vote, which was undertaken under conditions of severe intimidation by Indonesian security forces, resulted in the death of an estimated 1,500 East Timorese and the physical destruction of approximately 80 percent of the country’s infrastructure. Despite rulings by U.N. tribunals, Indonesian security force officials still have not been punished for these crimes, much less for those carried out during their 24-year occupation of East Timor. Six years later, the Indonesian government and separatists in the province of Aceh reached an accord, ending a decades-old conflict in which the abuse of insurgents and civilians had been rampant. In the Suharto and early post-Suharto era, the Indonesian military, acting in part to defend commercial interests including logging and drug running, employed tactics developed in similar repression campaigns in Papua and Indonesia-occupied East Timor. The 2005 peace settlement was memorialized in a memorandum of understanding that pledged formation of a human rights court and a truth and reconciliation commission to address decades of security force abuses. Thirteen years later, the government still has not created either body. Papuan resistance to Indonesian control has been active since 1969, when Jakarta, in violation of its commitments under a 1962 U.N. mandate, forcefully annexed the province. Government-organized transmigration of Indonesians from other islands to West Papua has marginalized the native Papuans as resources and assistance programs are diverted to the new arrivals. For the most part, local resistance has been nonviolent, yet security forces often attack peaceful demonstrations. There is a small armed movement, but it is largely rural and poorly armed; it targets security force personnel and installations, as well as some corporations exploiting West Papua’s vast economic riches. In response, the Indonesian military conducts sweeps that force whole villages to flee to surrounding forests and mountains, where they have inadequate access to food, medical assistance and shelter. In addition, Indonesian special forces murdered the Papuans’ most prominent nationalist leader, Theys Eluay, in 2001. The perpetrators received minimal sentences. The Indonesian government has long impeded coverage of its pervasive human rights abuses in West Papua. In policies and practices that have not changed substantially since the Suharto era, the government prevents journalists, researchers, human rights monitors and others from traveling to and working in the province. Through a “clearing house” comprised of security forces and various government ministries and agencies, it severely restricts access; those few observers allowed to visit endure restrictive itineraries and invasive monitoring. Papuans believed by the government to have cooperated with journalists and human rights monitors are singled out for harsh, extra-legal retribution. Through these restrictions, the post-Suharto administrations have prevented international monitoring of crimes against humanity extending to ethnic cleansing and what knowledgeable observers have described as “creeping genocide” in West Papua. Like his predecessors, Pres. Widodo has pledged to reform Indonesia’s approach to dealing with Papuans, but these pledges have yet to bear fruit. In May 1998 Indonesian students demonstrating for democracy and for President Suharto to step down took over the Parliament compound. This photo was taken after Suharto had ceded power to his vice president, B.J. Habibie. 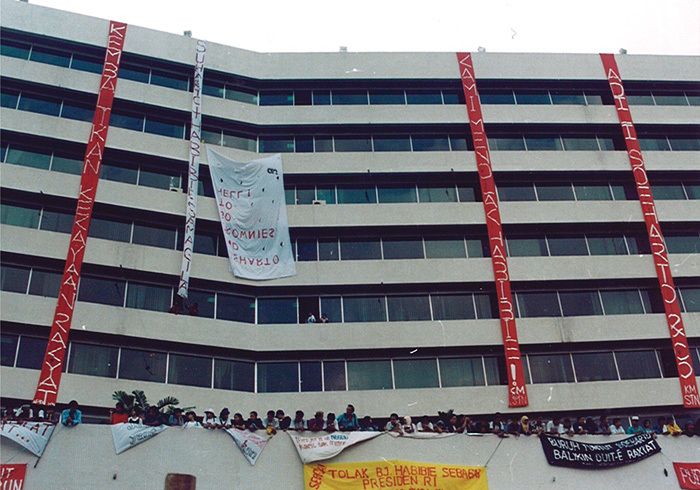 The red banners read “Return wealth to the people” (far left), “We Reject Habibie” (middle) and “Justice for Soeharto & Co” (far right). The Suharto dictatorship recognized the potential for instability posed by the archipelago’s religious, ethnic and racial diversity. While the dictatorship enshrined Javanese dominance of this multiethnic society, it carefully balanced and contained potential challenges to the system, especially as posed by the dominant faith, Islam (87 percent of Indonesians are Muslim). Leading Islamic organizations, notably Nhadlatul Ulama, played a central role throughout the Suharto era in creating space for religious tolerance among Indonesia’s Buddhist, Hindu, Christian and Islamic confessions. In the latter years of Suharto’s reign and since, however, foreign funding for establishment of Islamic boarding schools (called pesantren) and other Islamic institutions has grown significantly. Most of that funding has come from Arab Persian Gulf states and has promoted the ultraconservative Islamic doctrine of Wahhabism. Indonesia’s history of tolerance among Islamic sects and toward non-Islamic faiths, based on Indonesia’s founding pluralist philosophical principle of Pancasila, is diminishing. A growing intolerance has not only fueled anti-Christian prejudice, but has targeted other Islamic groups, notably the Shia, Ahmadiyya and Kebatinan (a syncretic amalgam incorporating Hindu and Buddhist traditions). Anti-Christian prejudice is fueled in part by the significant proportion of Indonesian Christians who are of Chinese ethnic background. The Chinese-Indonesian community has often been a scapegoat in times of political and social tension because of the wealth they are reputed to possess. For example, during the widespread street violence that preceded the 1998 downfall of the Suharto regime, organized in part by elements in the Indonesian military, Chinese communities were specific targets. And in 2017, Vice President Jusuf Kalla claimed that “inequality” was driven by religious differences. The emergence of militant Islamic groups, such as the Islamic Defenders Front, Hizbut, Tahrir Indonesia and Laskar Jihad has further undermined Indonesia’s traditional tolerance. Several of these groups have benefited from cooperative relations with the Indonesian military, enabling them to commit violence against religious and secular organizations, businesses and individuals who do not adhere to their strict religious precepts. The intrusion of religious and ethnic intolerance into Indonesian politics appears to be escalating. In 2017 Basuki Tjahaja Purnama (aka Ahok)—the governor (mayor) of Jakarta, one of the most powerful political positions in the country—was defeated in a re-election bid. Ahok had been vice governor of Jakarta and was elevated to the governorship when Jakarta’s then governor, Joko Widodo, was elected president of Indonesia in 2014. Despite very high job-approval ratings, Ahok’s loss was widely seen as the result of his Chinese-Christian lineage. However, another factor was the release of a video of an Ahok speech that had been altered to make it appear he was insulting Islam. The winning candidate, Anies Baswedan, ran an explicitly sectarian campaign and appeared before the radical Islamic Defenders Front to court its support as a Muslim. Adding insult to injury, shortly after his defeat Ahok was convicted of blasphemy, and is currently serving a two-year sentence. Indonesian democracy has made impressive strides, particularly in light of its long repression. The rapid emergence of nongovernmental organizations focused on defense of democracy, human rights and the environment incubated a mostly young cadre of Indonesians who have played substantial roles in assisting at the birth of Indonesia's democracy. Their vision and courage, along with that of a vibrant print and broadcast media, have provided a stable basis for its further development. Yet the country continues to face many of the same economic and political challenges it confronted when the Suharto regime fell. While poverty rates have been cut in half over the last 20 years, 10 percent of the population remains below the poverty line; another 40 percent is described by the World Bank as vulnerable to falling below that line. The World Bank also notes that the wealth gap is growing. Radical sectarian elements, particularly militant Islam, as well as political opportunists among the old elite who fear the rise of democratic forces, will undoubtedly continue to exploit the resulting social unrest to destabilize the democratic process in Indonesia. Corrupt and impervious to calls for its accountability before the Indonesian judiciary, the Indonesian military conducts itself very much as a Suharto-era institution, with no strong commitment to the observance of human rights or democratic norms. This is especially apparent in West Papua, where it has ruthlessly repressed democratic and pro-independence activists much as it did in East Timor and Aceh. Its influence in the political realm and its access to significant financial, training and other assistance from abroad, including the United States, render it largely immune to ongoing calls for reform. Advocates of U.S. assistance to the Indonesian military have long argued that such support, in particular training for senior Indonesia officers, exposes the Indonesian military to U.S. values and the proper role of the military in society. Critics of this support point out that some of the most egregious human rights abuses were committed during the Suharto years, when U.S.-Indonesian military cooperation was broadest. Critics also point out that some of those Indonesian military officers with strongest ties to the U.S. military, including Generals Wiranto and Prabowo, have the darkest human rights records. These critics of U.S.-Indonesian military ties argue that the prospect of U.S. assistance should be employed to press for reforms of the Indonesian military. U.S. government support for democratization and respect for human rights has included training and other assistance for the Indonesian police. The national police force nevertheless remains significantly corrupt, and its human rights record, including treatment of detainees, remains a problem. U.S. government support for and cooperation with Indonesian NGOs, especially those advocating reform and respect for human rights, has had a positive impact. Accordingly, despite significant progress and the courageous work of its reform-minded citizens, Indonesia’s democratic experiment remains very much a work in progress. 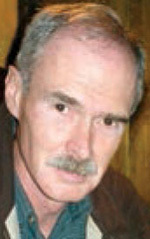 Edmund McWilliams, a retired Senior Foreign Service officer, was political counselor in Jakarta from 1996 to 1999. Between 1975 and 2001, he opened and served in U.S. embassies in Bishkek and Dushanbe, and also served in Vientiane, Bangkok, Moscow, Kabul, Islamabad, Managua and Washington, D.C. 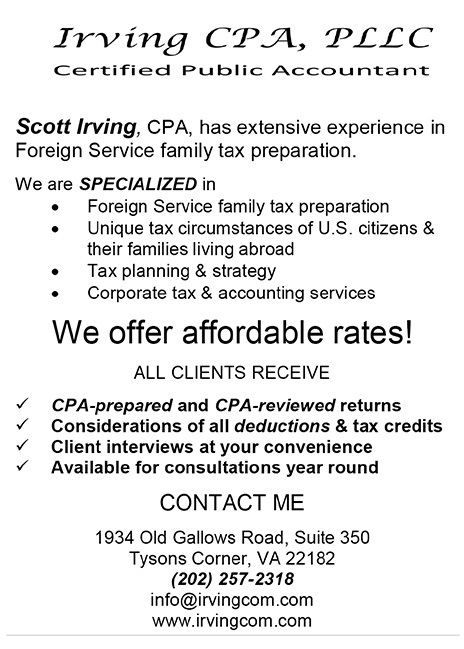 Since retiring from the Service, he has volunteered with U.S. and foreign human rights nongovernmental organizations. The author dedicates this article to the memory of Isa Gartini, a longtime employee of Embassy Jakarta who worked tirelessly to improve the observance of human rights and promote democratization in Indonesia. She passed away in January.